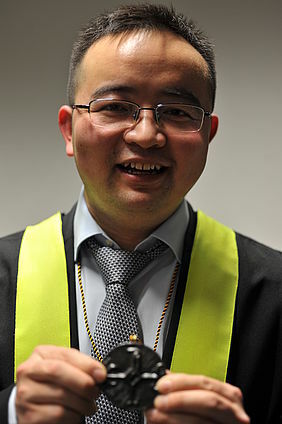 We congratulate Haichun Jiang for successfully defending his PhD thesis! Haichun Jiang’s oral exam took place on the 07th January, 2018 where he successfully defended his thesis on “Low cycle fatigue in precipitation-strengthened AA6016 alloy”. His dissertation was on the precipitation behavior und the influence of precipitates on the cyclic loading behavior of AA6016 alloy.This success was celebrated with IMM’s traditional doctoral ceremony and closed with a visit to the Aachen-City. We are wishing Haichun all the best in his future endeavors!